Typical gases present in underground car parks are: CO, NO2, NO and petrol vapours. CO/NO2 measurement and control systems are therefore standard equipment in underground car parks and bus parking garages to regulate air quality and protect personnel. 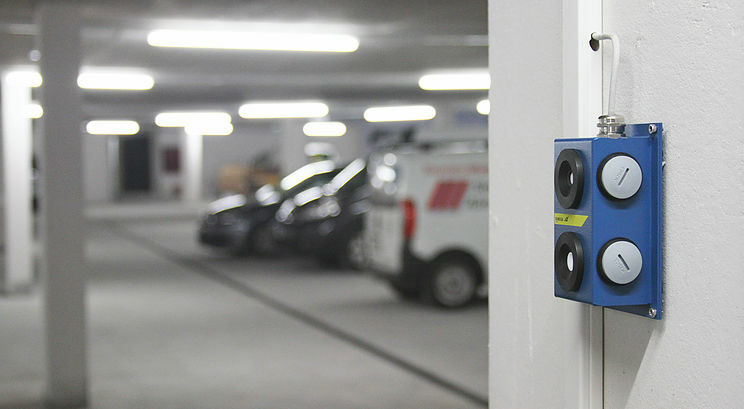 Energy efficient control of ventilation systems, safety and air quality are critical requirements in the provision of a gas monitoring system for underground car parks and garages. The new generation of versatile CANline gas monitor control units are a cost effective solution for small and large installations. Precise and selective measurement is a prerequisite for the best results. Innovative and tailored design of the CANline gas monitor enables versatile, convenient control of the ventilation system. Individual ventilation protocols are created with user selected Kimessa control programs. The integrated fan activation and deactivation time delays prevent premature fan activation due to locally elevated CO concentrations (petrol vehicles) or NO2 concentrations (diesel vehicles). The quality and accuracy of CO/NO2 measurement is dependent on the detector measuring principle. KIMESSA CO/NO2 gas detectors are equipped with a selective electrochemical sensing element. This guarantees an effective optimum operation of the ventilation system while maintaining the required safety threshold from vehicle exhaust fumes. 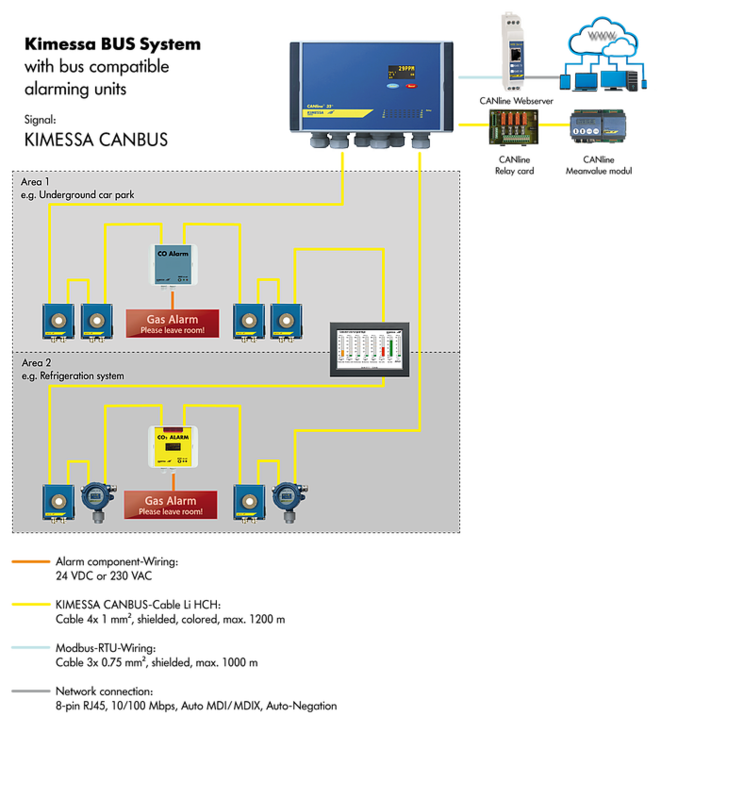 Touch screens or Web servers can be used for the visualization and rapid control of gas monitoring data. All data is of course recorded and can be viewed locally on the touch display or via the Web browser on any PC. The CO/NO2 gas concentration in an enclosed space can quickly increase due to heavy traffic movements or a vehicle engine malfunction and result in a potential poisoning hazard. Exhaust gas detection ‘gas alarm signs’ promptly alert any persons at risk to the presence of excessive gas concentrations in the ambient air. The ‘gas alarm signs’ are installation friendly and can be perfectly integrated in any enclosed space, even with sophisticated architecture. Symbols and text are used to convey the correct response to an exhaust gas alarm. The text is available in several languages and the design of the ‘gas alarm sign’ can be individually adapted (height, pictogram, etc.). On request the complete gas detection system including the ‘gas alarm sign’ can be provided with an emergency power supply. The KIMESSA system allows for the option to integrate a UPS (uninterruptible power supply) to be integrated into the control cabinet and therefore does not require its own housing. 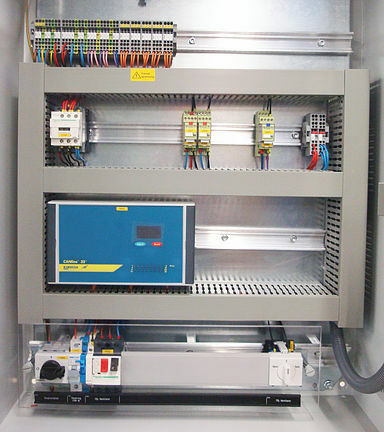 Alternatively, we can install all items in a project-specific control cabinet. Our gas detector housings are made of welded stainless steel, are extremely robust and offer excellent protections against vandalism, an unfortunate occurrence in public car parks. To differentiate the Kimessa BUS technology gas monitoring concept from our competitors; we also completely integrate the alarm activity into the BUS. For example, the LED warning lights and the alarm sounders can be integrated into the BUS. This means a significant saving in cable runs. A further advantage is that extensions or changes can be performed economically and new cable runs are possible at any time. To overcome the problem associated with high humidity and damp conditions in underground car parks, Kimessa offers a differential moisture control solution for the dehumidification of underground car parks. Provided that the air outside of the building is dryer than the air inside, the differential humidity control developed in-house by KIMESSA acts as an efficient space dehumidifier upon activation. With differential moisture control, one humidity/temperature sensor is fitted in the enclosed space and a second humidity/temperature sensor is fitted outside the building. The two sensors are connected to the KIMESSA moisture controller, which is preferably installed in or next to the control cabinet. The KIMESSA humidity control unit evaluates the sensor data and stops the fan as soon as the absolute humidity inside the building is higher inside than outside.